Prevention was the most important dimension of the Responsibility to Protect’s foundational documents and subsequent advocacy efforts. However, the actual implementation of protection on the ground has focused on reacting to crises. This article develops a case study of war resumption in Congo in 2008 to understand why and how this happened. 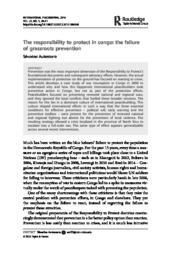 International peacebuilders took preventive action in Congo, but not as part of the protection efforts. Peacebuilders focused on preventing renewed national and regional wars, and they ignored the local conflicts that fueled these broader tensions. The reason for this lies in a dominant culture of international peacebuilding. This culture shaped international efforts in such a way that the three essential conditions for effective prevention – political will, early warning, and the preventive toolbox – were present for the prevention of renewed national and regional fighting but absent for the prevention of local violence. The resulting strategy allowed a crisis localized in the province of North Kivu to escalate into a full-scale war. The same type of effect appears generalizable across several recent interventions.